In the previous post I talked about using JFreeChart to create a plot of the last 8 hours. I have never been satisfied with only 8 hours but had never spent the time to fix it. To make matters worse I also wanted to have a website where I could see a list of the the flood events as well as plots of that data. Well, this week I am going remedy this annoyance, and while I am at it, I am going to fix a bunch of things that I left hanging. 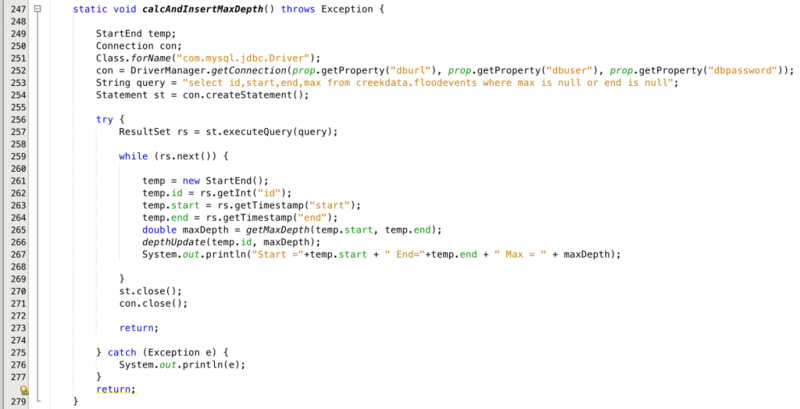 The next step was to create a java program called “ProcessEvents.java” that would analyze the raw data in the creekdata table using the “known” events from the floodevents table. The first thing that I did was create a helper class called StartEnd that hold one record from the floodevents table. The lowest “id” in the floodevents table is 1 so the 0 default for id represents a record that is not yet in the database. The program works by implementing the following algorithm. The “findStart” function returns a timestamp for the start of the next event. 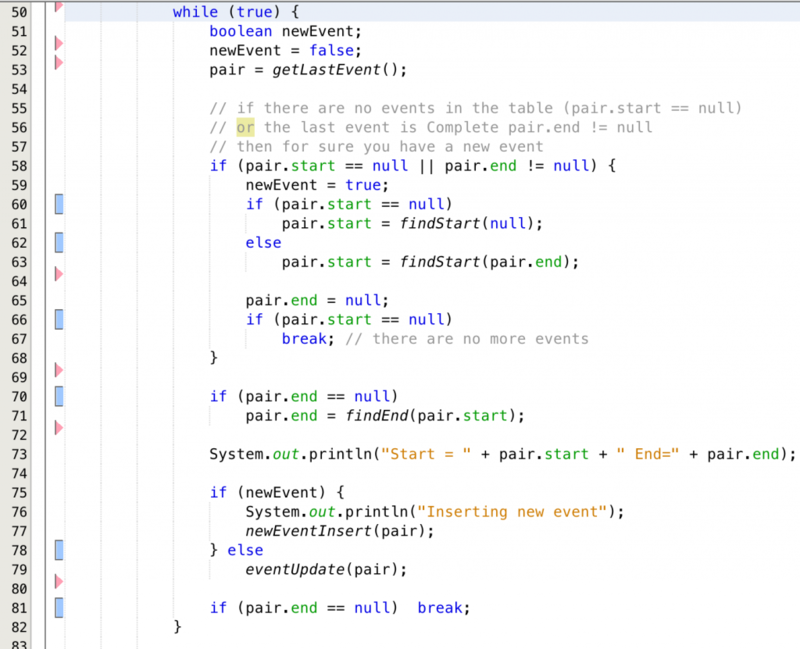 If it doesn’t find one then it return null. 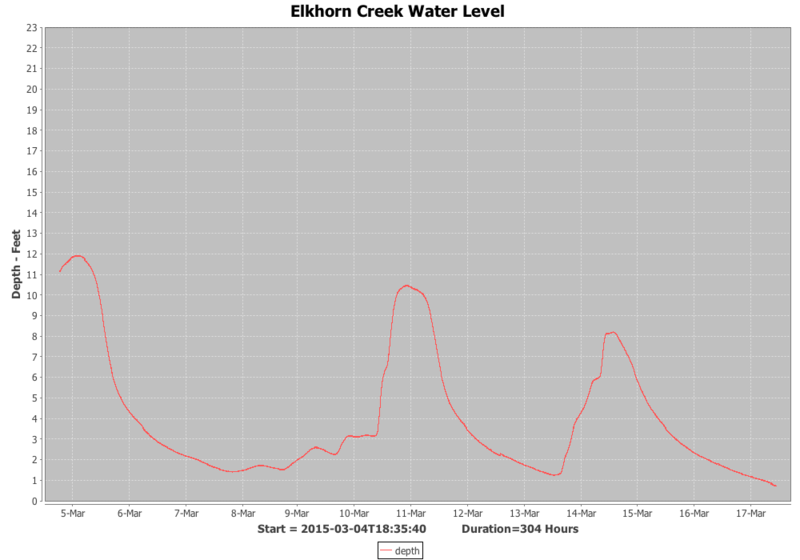 The function looks through all of the creek data starting from the beginning [line 149] or after a time [line 151]. My program has a little bit of hysteresis in that it “starts” a flood when it get to 2.0 feet and it “ends” a flood when it gets below 0.75 feet. If there is a little bit of noise around the upper trip point or the lower trip point it won’t turn on/off. The “findEnd” function returns a timestamp for the end of the current event. If it doesn’t find one then it return null. The “depthUpdate” function takes in an “id” of one of the events and a calculated “maxDepth” then updates the “max” field for that id in the floodevents database. 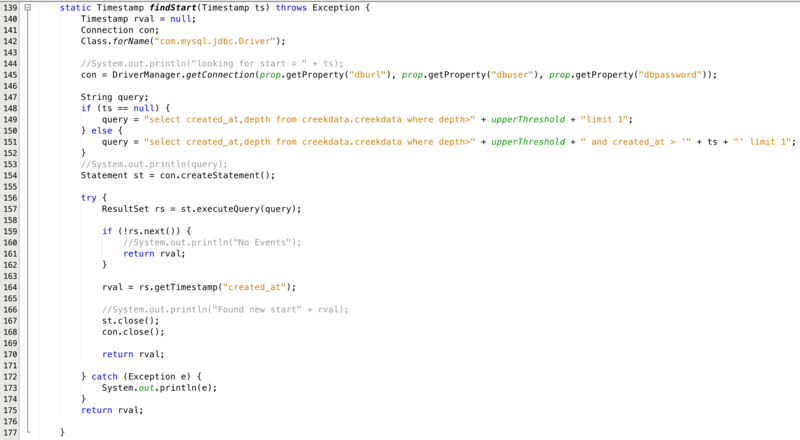 All of this code is available on the iotexpert github site in the java program “ProcessEvents.java” which is in the “getCreek/src” directory. In the next post I will talk about all of the modifications to the chart creation program that I made to support creating the flood events charts.